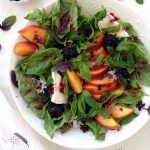 This basil and peach salad recipe is a lovely marriage of fragrant basil and yellow peaches dressed in a refreshing honey lemon vinaigrette! 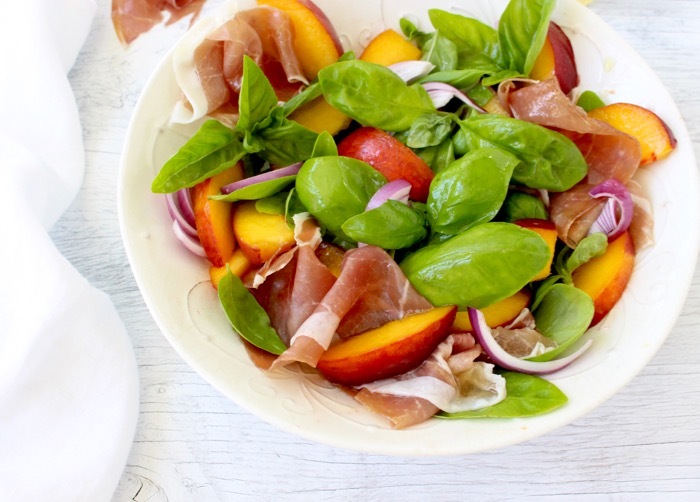 I’m so stocked about this peach salad recipe today! Mostly because it is just perfection of nature, and then you can only make this for about two, three months of the year. 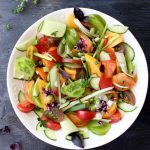 Of course salads are a simple mix of ingredients tossed together in some lovely dressing. So adding the word recipe to peach salad might seem a little bit silly but that’s what we do here, recipes so we roll with it. 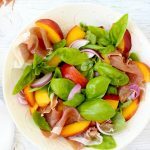 I harvested the basil the other day, and since it was my lucky Perfect Peaches day at the market, I just had to make the ultimate peach salad recipe. You planted basil this year right ? 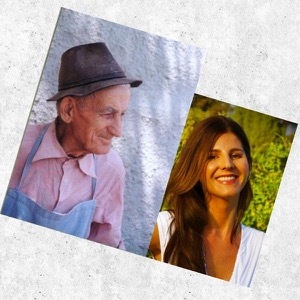 I day dream of my own peach trees some day. Just so that around this time of year, I can walk outside and pick a perfectly ripe and juicy peach to take a bite out of. The extra juicy kind that drips all the way down your arm, and into your shirt as soon as you sink your teeth into it for the first bite. 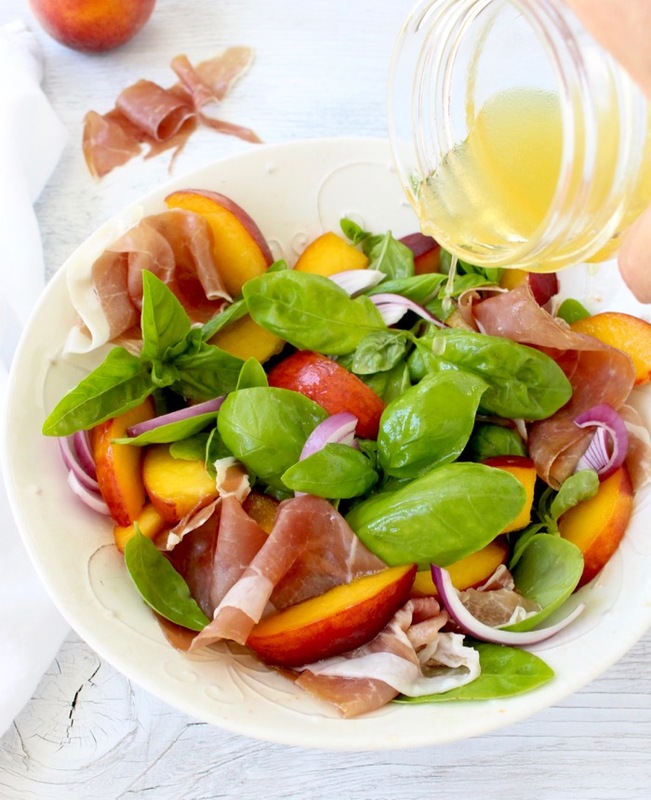 And then of course, I’ll make bowls upon bowls of this peach salad recipe, dressed in my citrusy honey lemon dressing, and finished with ribbons of aged Prosciutto do Parma. Only this time I went sweet and savory, with a little bit of purple onion and the prosciutto in the mix. Feel free to add the goat cheese to this one if you prefer too. Personally for me, the simplicity of this peach salad recipe is what summer cooking is all about. There is so much flavor going through this bowl from the freshness and perfection of the ingredients, that you really won’t miss the cheese. You definitely want to use Perfectly ripe peaches. Yellow and juicy, but without being mushy. You want to have some texture as well. I grow my own basil, so I always harvest the top leaves, the most tender of them all with a bright green color. I wouldn’t use the really large leaves that come in those bunches at the market, they are kind of chewy and more pungent. 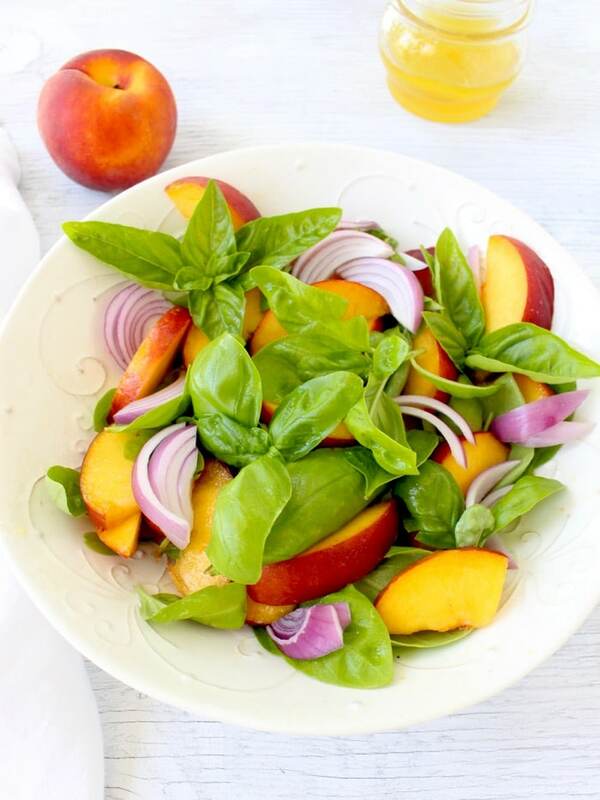 The tender basil leaves have a smooth fragrant aroma that is pleasant to the taste buds, and make a perfect marriage with the sweetness of the peaches! 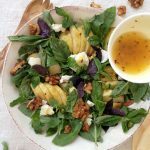 But this peach salad recipe has a very short lived season, which is why Now is the time to get our peach fix! 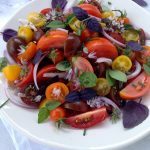 Pick the youngest most tender basil leaves and add them to a salad bowl. Rinse and slice the peaches into wedges and add them to the bowl with the basil leaves. Sprinkle with the purple onion slices. In a medium jar mix together the honey lemon vinaigrette ingredients. Shake together the olive oil, lemon juice and honey until combined. Season to your taste with a pinch of sea salt. Add more lemon juice or honey If preferred until your taste buds are happy. 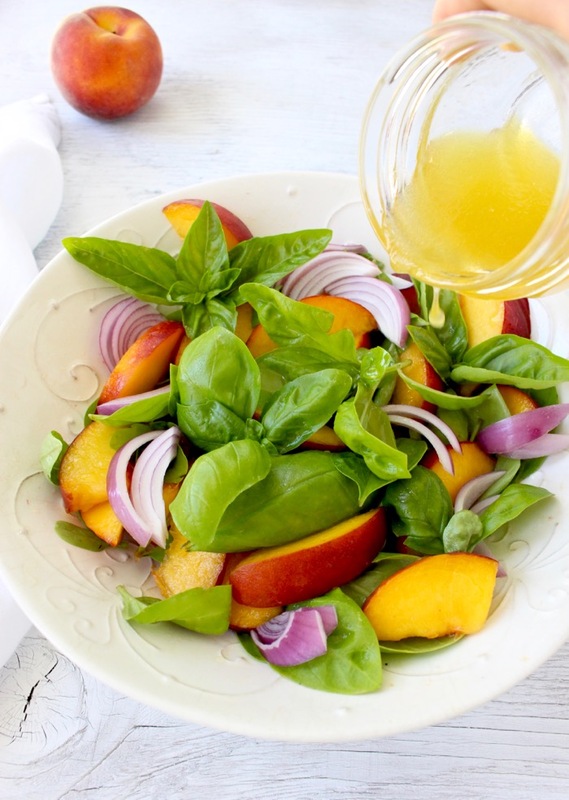 Pour some of the honey lemon vinaigrette over the basil peach salad and gently toss to coat. 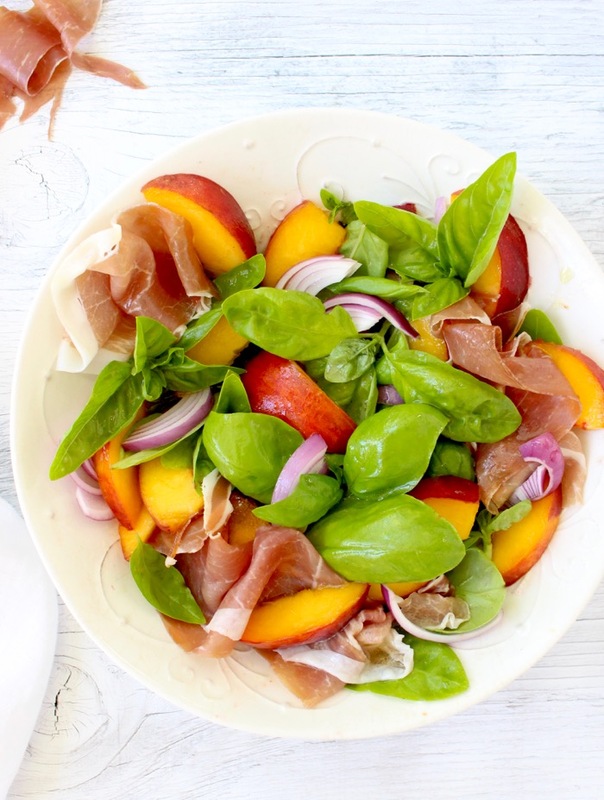 Place the prosciutto di Parma on top of the peach salad and serve as is, or with some goat cheese crumbles on top. If available you can use a white peach balsamic vinegar instead of the lemon juice. Makes for a really lovely alternative.